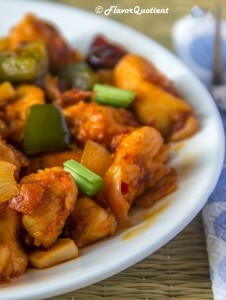 Today’s recipe is quick and easy but delicious Indo-Chinese dragon chicken flavored with our favorite Schezwan sauce! Today I bring to you a very fun-filled recipe! You have already seen the name above – yes, it is dragon chicken! Doesn’t the name sound queer? It did to me when I first saw this dragon chicken on the menu of one of our favorite Chinese take-aways. We were immediately tempted to try this starter called dragon chicken and oh boy! I must warn you, this dragon chicken is definitely not for the faint hearted! 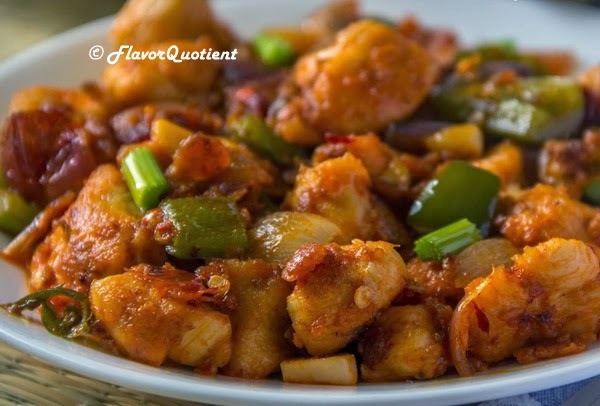 This Indo-Chinese chicken starter dragon chicken is a uber spicy dish which will delight every spice-lover out there just as it delighted my hub! While devouring our dragon chicken, I was trying to decode the recipe in my mind. I was sure that my hub will plan to make his own dragon chicken at home and would definitely ask me how to make it! I didn’t get a chance to get hold of the dragon chicken recipe from our Chinese food counter, but I deciphered that the spicy Schezwan sauce might have done the trick! And it worked! We could replicate the perfect dragon chicken at home! Before going into the recipe of dragon chicken, let me give you a quick life update! Our long vacation is coming to an end and it’s making me madly depressed. After many years our whole family reunited and spent wonderful time together. Fortunately, my birthday falls during this time of the year which doubled the celebration. We had so much fun that I didn’t get a single moment to log on and check my blog which resulted in an inevitable long break. Now as the celebration time is approaching to its end, I thought of concentrating on filling this gap which will at least give me some pleasure and let me forget the sadness of parting with family. There is an excessively huge backlog now due to this long absence. I have no plan on how to manage it. So, I started clearing the backlog by sharing the most delicious recipe i.e. dragon chicken from the long list. Hope you guys will love it as much as we did! Wash and cut the chicken breasts into bite sized pieces. Season with salt and set aside. Cut the onions in big chunks and then separate each layers. Cut the bell pepper in one inch long square pieces. Slice the garlic cloves and dried red chilies. Heat oil in a non-stick frying pan and shallow fry the chicken cubes in batches till they are golden brown. Keep aside. Heat little more oil in the same pan and add the sliced garlic, red chilies, chopped onion and capsicum. Sauté on high heat for five minutes until they are soft. Now add the Schezwan paste/sauce and half a cup of water. Keep stirring on high heat. Tip in the fried chicken cubes and stir to mix thoroughly so that all the pieces are coated well with the Schezwan paste. Taste and adjust the salt if required as the Schezwan paste/sauce is already quite salted. Splash some water if it becomes too dry and stick to the pan. 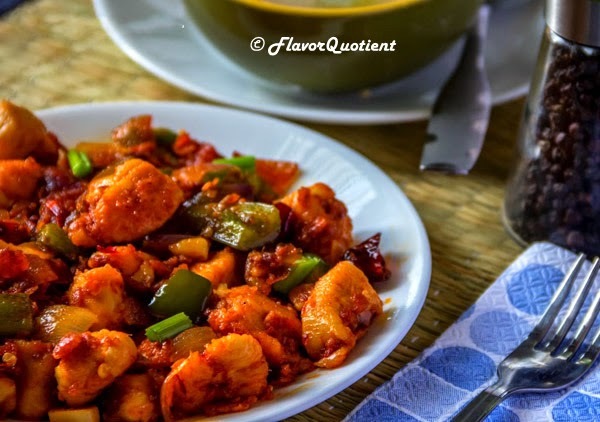 Sauté till the chicken cubes are tender and fully cooked and the sauce has the coating consistency. Serve this dish as a starter and make it an instant favorite of the whole family. Ooooh, this looks delicious! Plus, short and sweet ingredients lists are always awesome! Thanks for a great new dinner idea! Thanks Ashley! Am glad you liked it! Any advise on the •Schezwan paste/sauce. Can i pick up the normal Schezwan sauce available. You can use the ready-made paste available in store, they are quite spicy though. I will post a recipe for home-made Schezwan paste shortly! Stay tuned!